A wish list book purchased from Amazon using a gift card. I thoroughly enjoyed "Pillars of the Earth" and "World Without End" and look forward to reading this third novel centered around Kingsbridge Cathedral. 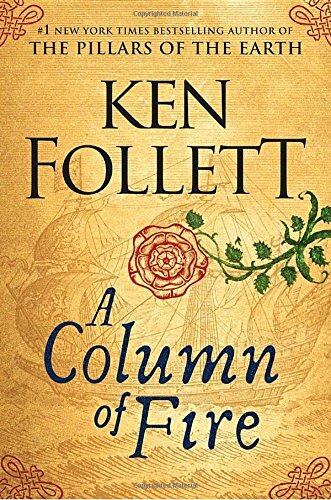 In "Pillars of the Earth", Follett described the building of the Kingsbridge Cathedral in a sweeping epic novel set against the chaos of the succession battles that followed the death of King Henry I in the 12th century. Then, in "World Without End", he uses Kingsbridge and its cathedral as the focal point in a story set against the beginnings of the Hundred Years War and the arrival of the Black Death in England in the 14th century. This third novel returns to the same location to tell the story of the reign of Queen Elizabeth I in the 16th century. Like the previous novels, this book focuses on the individual lives of residents from Kingsbridge, using their stories to illuminate the history of this period. But the history of this period is sweeping in its scope, and so the story covers a much broader geography, stretching from England and Scotland, to France, Spain, and the Netherlands, and all the way to the Caribbean. While the story is framed around the reign of Elizabeth, it is really the story of the struggles between the Catholic Church and the Protestants, as each strives to control power and populations. But, as Follett makes quite clear, the true struggle, which continues even today, isn't between Catholic and Protestant, but between tolerance and intolerance. As told through that lens, this story sheds considerable light onto the chaos of the religious strife of this period. As with the previous novels, Follett provides a great depth of detail about life in this period. This is no nostalgic portrait of a simpler, better time, but a harsh look at the brutal realities of a dangerous period of history. As such, some may find the graphic descriptions of the violence here a bit hard to stomach, but the is nothing gratuitous about them...they represent efforts to portray the bloody cost of the struggles waged during the fourteenth century. For those who enjoyed Follet's other stories about Kingsbridge, this is certainly a must read, but any fan of historical fiction is likely to enjoy this as well, especially those looking for a better understanding of the complex issues that drove the chaos of this period. Passing along to a colleague who is a *huge* fan of Follett's books. My friend stopped to pick up another Follett book and brought this one back to me. This will be available at today's BC-in-DC meeting at Northside Social, in Arlington.